You know that feeling of walking into one of the parks for the first time? 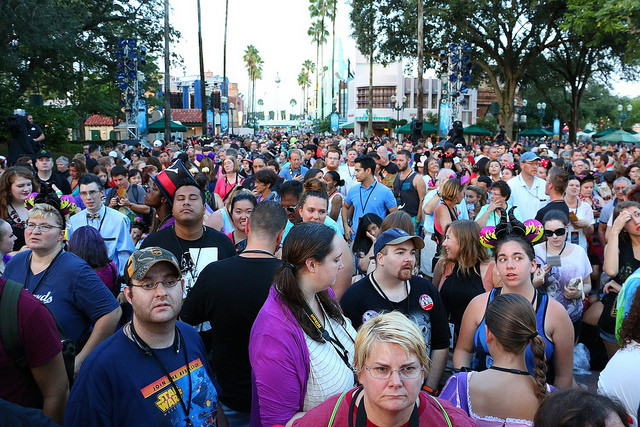 You hear the music in the queue, feel the energy of the crowd as people are waiting to enter the park, and once you get close enough, you can even smell all those wonderful Disney smells. Finally, you pass under the train station and emerge onto the most perfect scene as you see Main Street, USA in its full glory with the beautiful castle beaming in the distance. Now imagine this scene and add whimsical fall inspired decorations to it. It’s pretty incredible. I mean, I can’t stress how much I LOVE the fall decorations at Disney. They completely put you in the mood for some fall fun and gives a delightful spin to the normal Main Street fixtures. Epcot’s International Food and Wine Festival may be the belle of the ball when it comes to fall events at the Disney Parks. 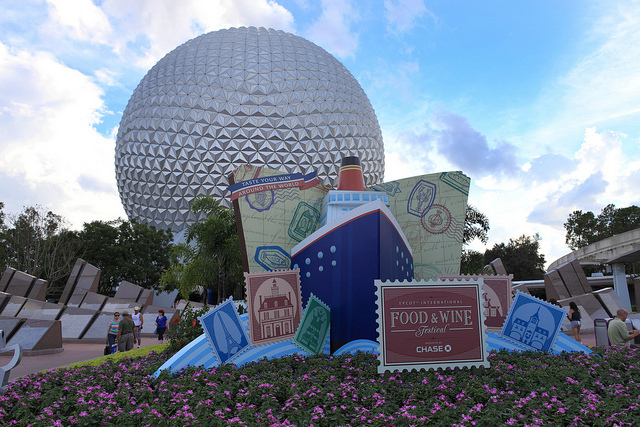 The event lasts for 3-4 weeks and incorporates international cuisine, beer, and wine set up in a multitude of unique kiosks around Epcot’s World Showcase. Try amazing food from Africa to Belgium to New Zealand, all in one day. 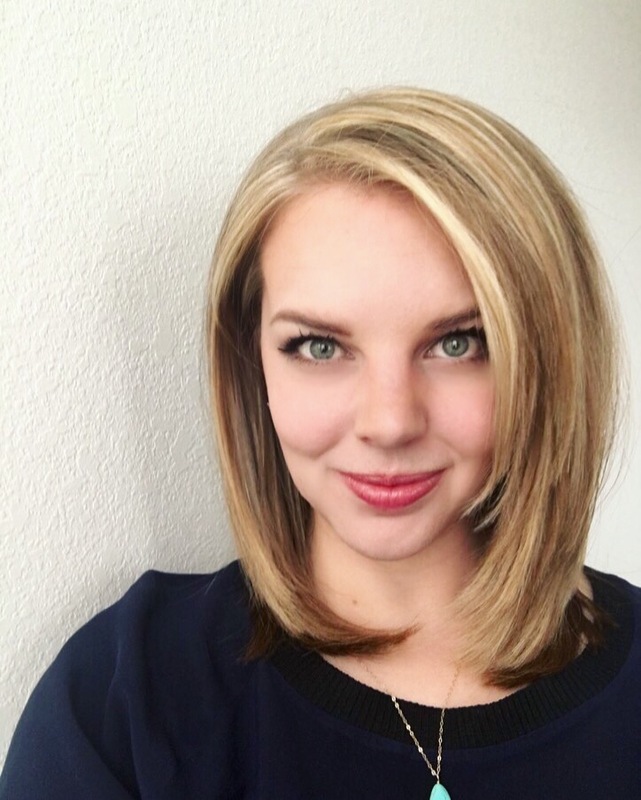 The festival also includes exclusive culinary demonstrations, seminars, and meet and greets with renowned top chefs such as Cat Cora, Norman Van Aken, Masaharu Morimoto, Elizabeth Falkner, Buddy Valastro, and Jamie Deen. Food and Wine also boasts a fun lineup of musical guests in the Eat to the Beat concert series available every night during the festival. For many, particularly those with young kids, the Halloween Parties are THE reason to visit the Disney Parks in the fall. Walt Disney World hosts Mickey’s Not So Scary Halloween Party while Disneyland Resort has Mickey’s Halloween Party on select nights in September and October. Both coasts celebrate with a Halloween themed party that allows guests to dress up in costume and experience specialized shows, food, merchandise, events and character meet and greets. One of the best things about the Halloween parties is the opportunity to experience things that are unique only to the party. You can meet some pretty obscure characters, mainly villains, and see (in my opinion) the best fireworks display Disney has to offer. The park is lit, decorated, and presented in an entirely different manner than it normally is, and it’s really something every Disney fan should experience at least once. 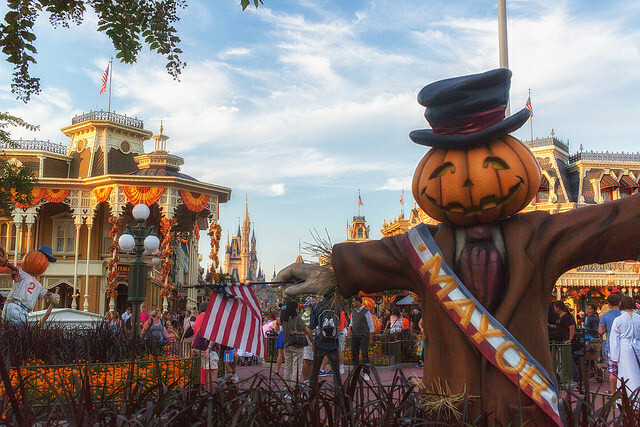 To find out more about MNSSHP visit my full guide here. Exclusive to Disneyland alone, the infamous Haunted Mansion gets a bit of a spooky makeover for the fall and winter months. Courtesy of Jack Skellington, Gracey Manor transforms with festive touches from Tim Burton’s The Nightmare Before Christmas. See spooky additions such as ginger-dread houses, blood-curdling pies and of course, Oogie Boogie! 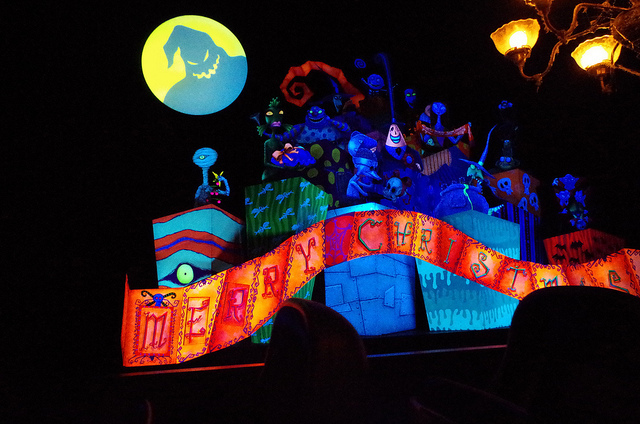 Haunted Mansion Holiday is one of the most popular holiday overlays in the parks, and completely transforms the classic attraction into something new. 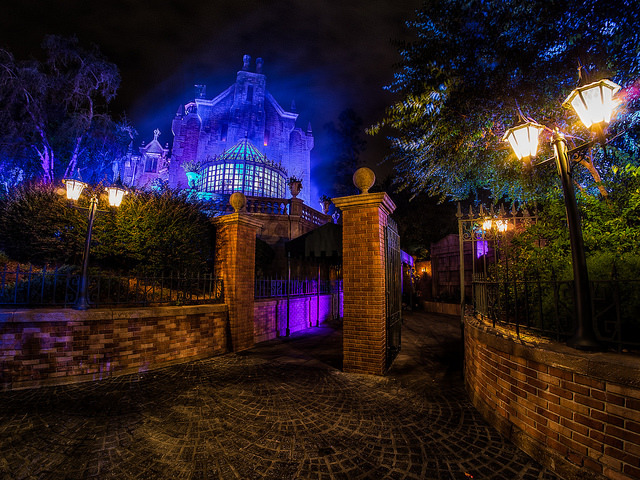 It’s definitely a must-see for Disney and Haunted Mansion fans! Fall wouldn’t be fall without all of its delicious seasonal snacks, and the same holds true at Disney. 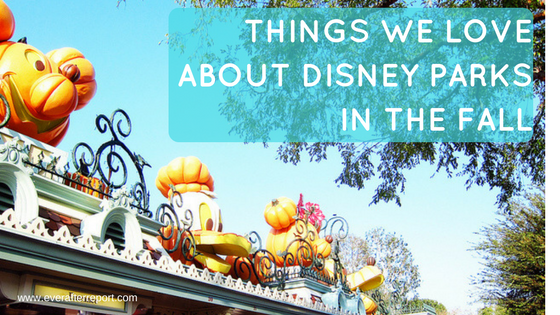 Some of my favorites include pumpkin beignets and Jack Skellington popcorn at Disneyland, and the apple pie sunday and poison apple mug at Disneyworld. 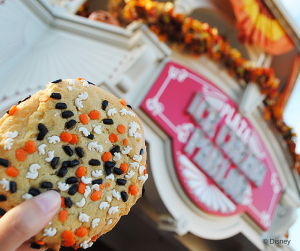 And don’t forget all the Halloween inspired treats found in both parks, such as the spider cupcake, candy corn ice cream, and Halloween cookie found at the Main Street Bakery or Confectionary. Be sure to check out my full list of the best Disney World Halloween Treats here! Okay, so this one is not exclusive to the Disney Parks, but there is something about sipping on a Starbucks Pumpkin Spice Latte while strolling down Main Street that is just so perfect. 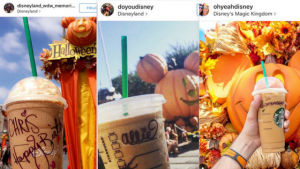 The PSL made a huge breakthrough several years ago when it debuted at Starbucks, and when the franchise landed in the Disney Parks, you better believed the phenomenon took on a life of its own among Disney and coffee fans alike! Instagram feeds have never been so perfectly pumpkiny! If you know a little bit about how the Disney Parks operate, you know the rates and crowds are based on a series of seasons that run throughout the year. The autumn months happen to be in the Fall Season (genius, I know), which is one of the slower times of year in regard to crowd levels. This is mainly due to kids being in school, so you’ll see fewer families than you will during the summer or Christmas holiday, however the Halloween parties do attract their fair number of young kids. Still, the crowds can be less than the summer, and you can enjoy slightly cooler weather, which often makes for a more enjoyable vacation. To learn more about the Disney seasons and how to take advantage of lower rates and crowds, click here. What are your favorite Disney fall moments? Let me know in the comments below! And if you’re planning a Disney vacation soon, be sure to download my totally customizable, FREE Vacation Planner! For more Disney in your day, follow Ever After Report on Instagram and Facebook.